Leadership takes many forms, it manifests itself in many ways. But what really makes a leader and what tendencies embody leadership? 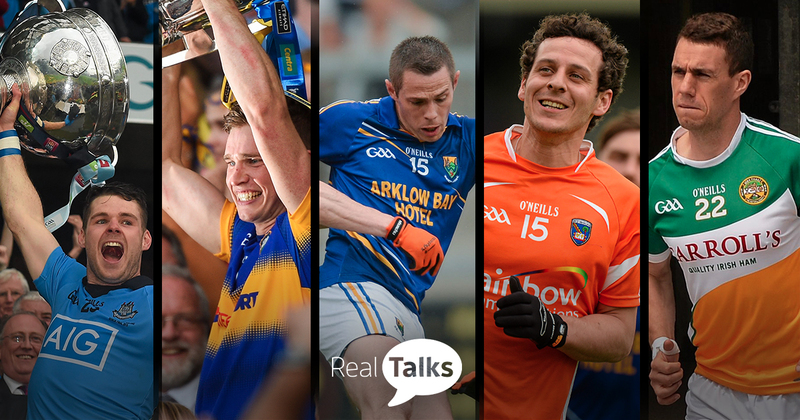 We look at what five of the biggest names in the GAA thought about leadership when they spoke to Alan O’Mara on the Real Talks Podcast. Sports fans have a tendency to romanticise the concept of a leader somewhat. We draw up images of chest-thumping, blood-spilling men and women who give their all and would almost lay their lives down to taste the sweet nectar of victory. Looking around the sporting pantheon, the traditional perceptions are continually drawn up – Paul O’Connell’s pre-match speech: “Did you put the fear of God into someone” or Roy Keane’s tunnel clash with Patrick Vieira but there are more than just one way to show leadership. The following five lessons on leadership became apparent from our detailed conversations with Kevin McManamon (Dublin), Brendan Maher (Tipperary), John McGrath (Wicklow), Jamie Clarke (Armagh) and Niall McNamee (Offaly). As an All-Ireland winning captain with Tipperary, Brendan Maher knows what it’s like to bear the weight of expectations. One of the biggest learnings he realised was that to have a lasting impact on the wider group he needed to be authentic in his leadership role. Instead of worrying whether to become an Alpha or Omega, he relaxed and stayed true to himself. He showed emotional intelligence and self-awareness to realise that a one size fits all approach to leadership simply wouldn’t work. “Putting yourself into other people’s shoes, trying to see what they’re seeing. It’s something I used as captain of the team. Just trying to understand that what works for me doesn’t necessarily work for everyone else,” he said. When Jamie Clarke broke into the Armagh team as a precocious youngster, there were no two bigger icons in the game than Steven McDonnell and Oisin McConville to look up to but even in his early twenties, Jamie was confident in his ability and assured in his style. His teammates understood he needed to express that to succeed. Leadership knows no generational gap. The resilience John McGrath showed when faced with adversity has inspired many others in unfathomable ways. Within six months of being diagnosed with leukaemia, John was back playing for his beloved club Baltinglass and within a year won a league a title in Croke Park for Wicklow. His journey is an amazing example of how mindset is crucial in overcoming challenges and becoming a leader in your own life. 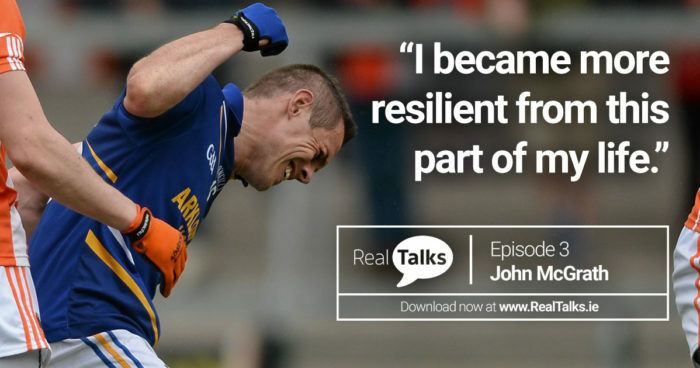 Within the podcast, John spoke passionately about how that difficult spell in life made him a more resilient person – a nice reminder that leadership skills can be grown and are not a fixed dosage we are born with. “The word cancer is not nice because we only hear the negative stories. When I got better, I made sure that I would try my best to show that it is beatable and not all doom and gloom”, he said. It is impossible not to admire Niall McNamee for speaking out about his gambling addiction and showing thousands of others out there struggling that help is available. In doing so, the Offaly man became the change he wanted to see in the world and indeed, in others. He stepped up to the plate. Gambling is an issue that is rife amongst people throughout this country, young men particularly. Stories, and individuals such as Niall who tell them, let people know that they’re not alone if they have issues. “I was looking for things outside of me to make me happy. Over the last number of years I’ve started to look inward and that is the journey I have been on,” he said. Success in the modern GAA is synonymous with the current Dublin gaelic footballers. A winner of four All-Ireland Championships, Kevin McManamon has been an integral part of a team that recently saw its long-standing unbeaten run come to an end. So what has being in such a successful environment taught him about leadership? In terms of being successful, McManamon also believe that a balanced lifestyle is imperative and it is up to each and every person to grow holistically and figure out what is right for them. “When I was pronouncing the other side of my life that I enjoyed, not only was I happier in general, but I was actually playing better!” he added. The Real Talks Podcast gives leading GAA players the opportunity to talk about life lessons, leadership, resilience, purpose, sport, passions and much more during a relaxed, meaningful and entertaining conversation. Find us on iTunes or SoundCloud by searching ‘Real Talks’.